Inflation is the opium of the masses. The establishment’s interest in dumbing down the masses through government controlled public school indoctrination couldn’t be clearer than examining the chart below. The average non-thinking, math challenged, iGadget distracted, media controlled pawn thinks their household income has risen by $6,000 since 2008 because they have no understanding of Fed created inflation. 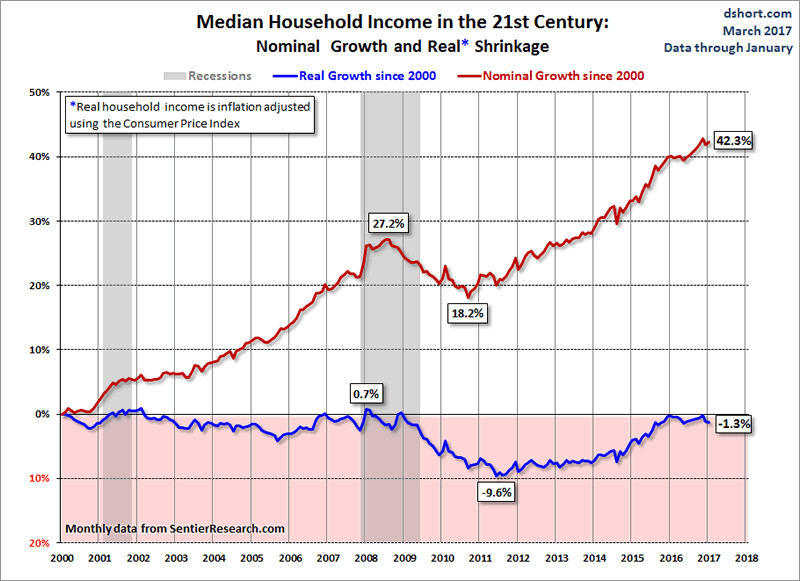 Even using the ridiculously downward manipulated CPI concoction shows the median household has lost ground. While median income has remained stagnant since 2000, the CPI is up 44%. Using honest inflation numbers would likely double that figure. Stagnant incomes with living costs 40% to 80% higher doesn’t exactly match the rhetoric of a strong economy being propagandized by the Deep State and their fake news media outlets. Even the BLS can’t hide the inflation ravaging middle class families and senior citizens on fixed incomes. And those fixed incomes are fixed at zero, as they get .20% on their savings and no increases in their Social Security payments. CPI is now 2.5% higher than one year ago, above the magic central banker 2% goal. It has been raging at an annualized 4.4% rate over the last three months. It is poised to go even higher in the next few months. Yellen and her intellectual yet idiot cohort of ego maniacal central banker brethren pretend they know the ideal rate of inflation to keep the economy running just right. See how well they’ve done since 1999, with two massive bubbles destroying the lives of millions and the mother of all bubbles (stocks, bonds, real estate) currently continuing to grow before it’s predictable incineration of wealth. 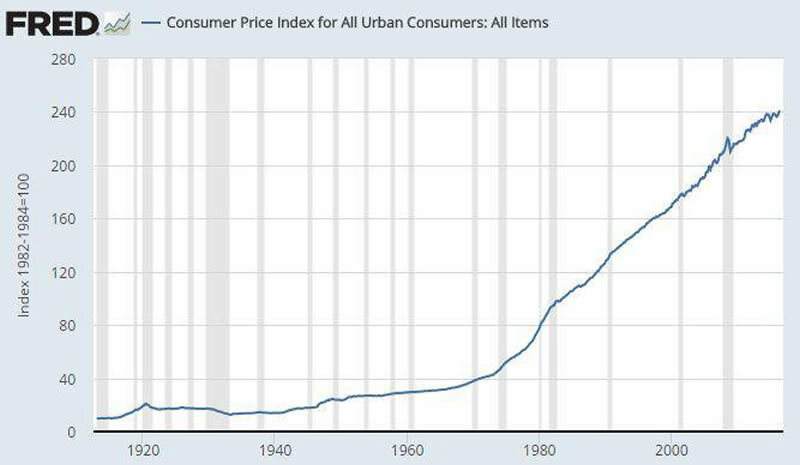 The Big Lie about the need for inflation has been pounded into the heads of the weak minded by the Fed, Wall Street shysters, fake news media outlets, and TV entertainers disguised as journalists and financial experts. This country became a worldwide industrial power while sustaining mild deflationary conditions for almost two hundred years. It wasn’t until the birth of the welfare/warfare state in the 1960s when corrupt politicians and spineless central bankers decided they needed guns, butter, and entitlements. Closing the gold window in 1971 and allowing politicians to run up the national debt from $400 billion (34% of GDP) to $20 trillion (106% of GDP), while making $200 trillion of unfunded entitlement promises, has been the result. Total credit market debt has risen from $2 trillion in 1971 to over $65 trillion today. Total global debt has surpassed $217 trillion, or 325% of global GDP. The only way to make these disastrously horrible decisions seem palatable has been to produce inflation at prodigious levels in order to make the debt appear payable. It’s not. Inflation and its supposed benefits is an example of how the Deep State has perfected the teachings of master propagandist Edward Bernays. Of course, the pliable public has been convinced government debt doesn’t matter because we owe it ourselves, or some such nonsense. They have also been convinced by Madison Avenue maggots and Wall Street shysters that luxury automobiles, McMansions, Rolex watches, 72 inch home theaters, iGadgets, and a myriad of other “essential” material possessions purchased with debt actually constitute wealth. Keeping up with the joneses has been brainwashed into the minds of the ignorant masses as their only true goal in life. The result is consumer credit of $3.8 trillion, the highest level in history. Since the 2008 financial crisis, created by the fraudulent issuance of mountains of subprime debt by Wall Street banks and stimulated by the easy money Fed, hundreds of billions of subprime student loan and auto debt have been dispensed to artificially boost GDP. This scheme was concocted by the Obama administration, Yellen, and their Wall Street puppeteers to bamboozle the public and temporarily jolt the economy. It failed. Over 25% of all student loans are in default. 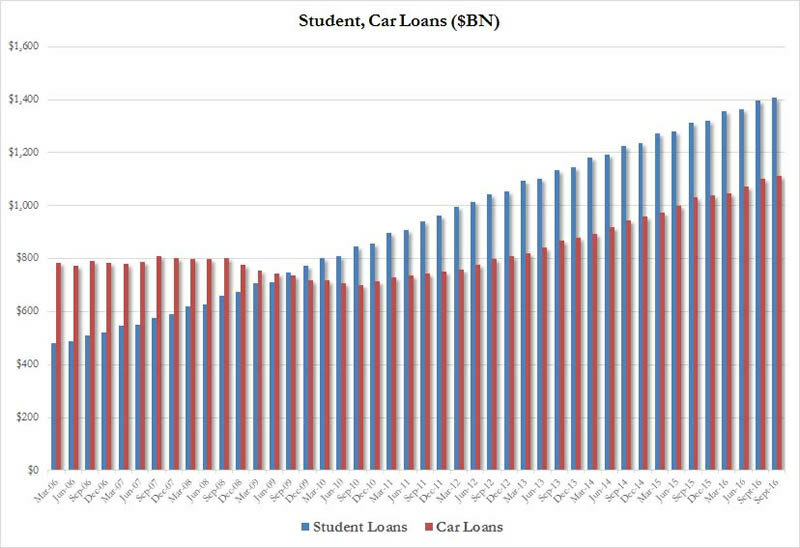 Six million Americans are delinquent on their auto loans. The taxpayer bailout when the student loan “crisis” suddenly hits will exceed $500 billion, as Obama has doled out loans to every functionally illiterate college wannabe in the nation. You’d think the payoff from doling out $700 billion in student loan debt would be more knowledgeable young people imbibed with the inspiration to change the world with their newfound intelligence and training. Nothing could be further from the truth. The $700 billion has produced illiterate, violent social justice warriors who despise free speech, can’t add, can’t write a sentence, and are virtually unemployable. But they are good at protesting, burning things, and being outraged by anyone they disagree with. This student loan debacle has been a purposeful scheme to artificially lower unemployment and provide the appearance of economic recovery, as the loan money has been used for iGadgets, booze, hookers and blow. Mission accomplished Obama!! 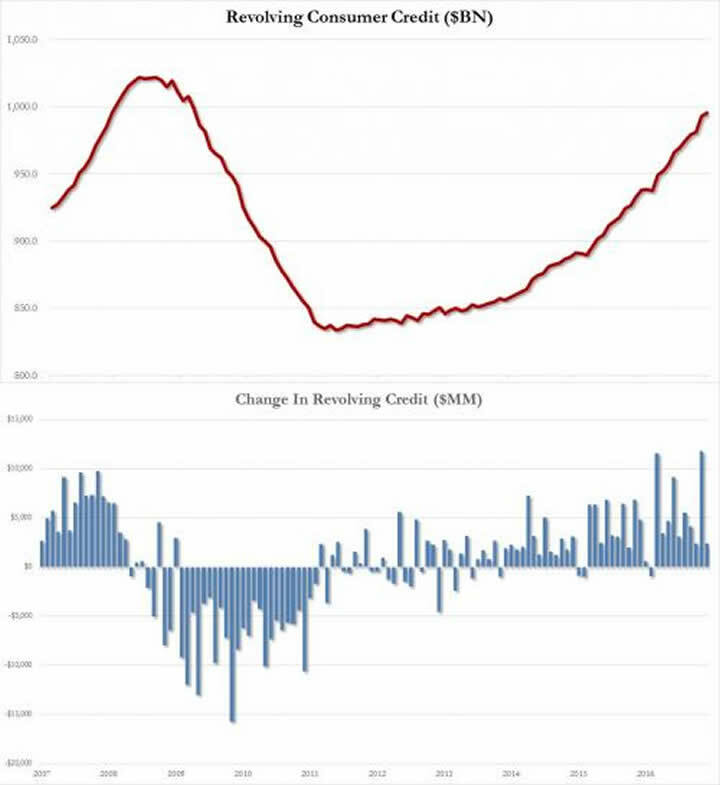 The one area of consumer credit which has not reached its previous bubble peak is credit card debt. After Wall Street wrote off $300 billion (funded by taxpayer TARP funds) they began issuing credit cards like candy, again. But consumers have been slower to whip out the plastic like the pre-2008 days. That’s why bricks and mortar retailers have closed thousands of stores and ghost malls across suburbia are the norm. So it begs the question as to why credit card debt has increased by $160 billion (up 20%) since its 2010 low. The answer is simple when you take into account the stagnant wages and rising cost of living documented earlier. Credit card defaults are so low because they are the only thing sustaining millions of families across the country. In case you haven’t noticed, the purveyors of credit on Wall Street, out of the goodness of their evil black hearts (they’ve paid $321 billion in fines since 2008 without admitting guilt or having one executive jailed), have convinced every level of government, every utility company, landlords, and educational institutions to accept credit cards for payment. Before 2000, all these bills had to be paid with cash on hand. Now you can pay your IRS bill, real estate taxes, monthly cell phone bill, school tuition or rent (with outrageous fees) with a credit card at 15% interest. Nothing like turning a $2,500 real estate tax payment into a $4,000 real estate tax payment, over time. It’s the American way. Desperate households across the land aren’t clinging to guns and bibles. They’re clinging to credit cards as their only lifeline in this failing empire of debt, deception, and delusion. When the next inevitable financial crisis strikes “unexpectedly” and even the low paying, no benefits Obama jobs disappear, even their five credit cards won’t keep them from getting kicked out on the street again. This isn’t just my pessimistic doom persona rearing its ugly head. My ponderings are based on common sense, an honest assessment of the real situation in this country and an understanding of the ebbs and flows of history. H.L. Mencken had similar views on government and the American people during the last Fourth Turning. Based on anecdotal and hard verifiable data, the average American family is in the midst of a recession, if not a depression. No amount of propaganda, misinformation, fake government data, or fake news can cover-up the facts. Donald Trump was elected president, not by misogynist, white, racist, xenophobes, but by families (men and women) who have been screwed over by the establishment for decades and left impoverished, hopeless, and depressed. He won the election because radicals like you and me decided to send a message to the arrogant, evil, globalist ruling class that we are mad as hell and aren’t going to take it anymore. Despair of the silent normal majority is what propelled Trump to victory. Choices have consequences. In Part Three of this article I will assess the early days of the Trump presidency, the full court press by the Deep State to bring him down, his unrealistic economic plans, and how our overvalued stock, bond and real estate markets will eventually crash, leading to the next leg down in this Fourth Turning.